[S863] Bartolomeo VENTURA entry, New York City Birth Record 10096 (18 Feb 1906). [S420] Unknown compiler, "Funeral Card, B J Ventura", Ancestral File, Card given out a funeral. [S869] Bartolomeo VENTURA entry, New York City Births Cert # 10096 (18 Feb 1906). [S449] Census 1910, NY, NY, Roll 1009, Manhattan Borough, Enum Dist 201 Page 5B. [S451] Census 1920 Cincinnati Hamilton Co Ohio. [S624] Unknown subject unknown record type; unknown repository. Mary Virginia Yacchari was also known as Virginia. Mary Virginia Yacchari appeared on the census of 1920 at Hamilton, Ohio, USA.4 She appeared on the census of 10 January 1920 in the household of Catherine Devoto and Peter Yacchari at Cincinnati, Hamilton, Ohio, USA.5 Mary Virginia Yacchari and Benjamin Joseph Ventura lived in 1938 at Cincinnati, Hamilton, Ohio, USA. [S677] Vol 2 June 29 Page 124, Baptism Certificate - Yacchari, Mary Virginia, 15 Jan 1911, Walter Dowling Wood. [S615] Virginia M Ventura, Death Record - VENTURA, Virginia M 1911-1983 Ohio. [S678] Drivers License - Ventura, Virginia M OHIO. After such fine fighting as that done by WILLIAM, JAMES, JOHN, and father ROBERT had caused the capitulation of Cornwallis at Yorktown in 1781, these Dowlings returned to their farms and the rural life that each followed. It was the following January 15th that JAMES'S third child was born there in the Jeffries Creek area of the sovereign state of South Carolina. JAMES and mother Mary Boutwell Dowling named him JOHN JABEZ. During the second war with the British JOHN JABEZ married, February 13, 1812. Bride Susan Barnes was the daughter of Theophilus Barnes and a Sauls mother. She was twenty-one when she married JOHN JABEZ, having been born March 4, 1786, in Prince William Parish, South Carolina. As previously mentioned, mother Mary Boutwell Dowling had left Darlington District after the death of husband JAMES. Neither of the son’s ages shown on her 1810 Barnwell District census fit the age of son JOHN JABEZ. So the family tradition which tells of JOHN JABEZ'S arrival in Beaufort District as early as 1807 is probably correct. It was there that his marriage to Susan occurred. And it was there, near today's town of Brunson, South Carolina, that this couple raised the five boys and five girls shown on DFS Chart 323. Great-great-grandchildren still inhabit the area. JOHN JABEZ was a meticulous person. He believed as much in orderliness that during one period of his life he kept servants on the lookout for any leaves that might fall in the Dowling yard; they were to pick them up instantly and take them back of the barn where they belonged! Religious services were attended by this patriarch in a silk, broadcloth suit and top hat. Still, there was a spirit of rebelliousness in him; when past sixty he went off to the Mexican War! (Earlier, he had fought in the War of 1812 as a soldier in Lowe’s Company of Colonel Youngblood’s Regiment.) 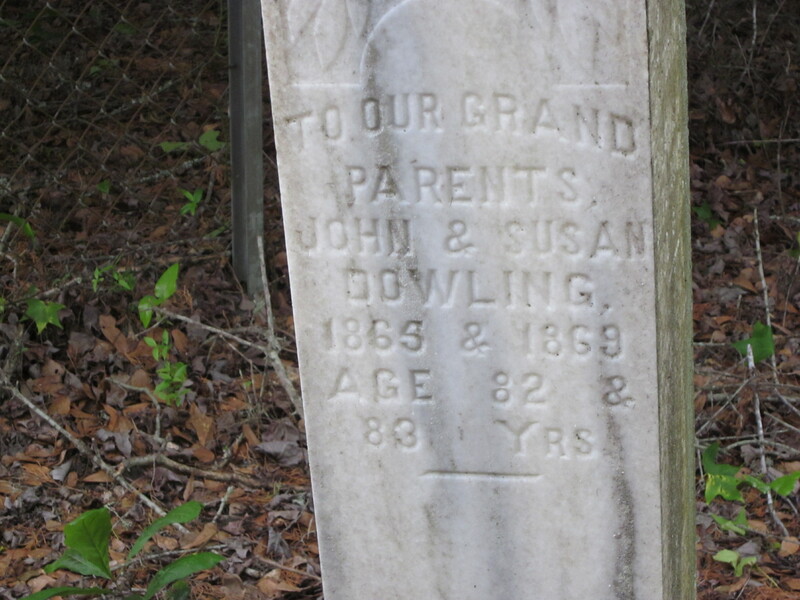 JOHN JABEZ and Susan are buried in the Dowling Cemetery near Brunson, South Carolina. Find A Grave Memorial# 12600136. Short Description: The War of 1812 pension files resulted from a man's service during the war, 1812-1815. They were granted to the veteran, his widow, or his heirs. [S508] Edward Barfield, Death Record - BARFIELD, Edward 1937 MO. in Napoleon, Ohio. Conf. in Niedringhaus. Verse - Matth. 24,13., Confirmation Records Lutheran Mission Assoc. 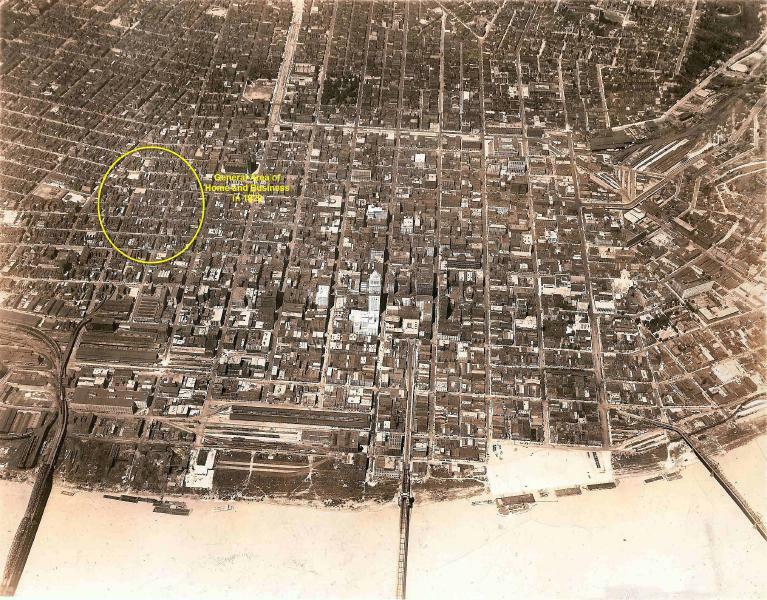 [S574] 23 Apr 1910 Federal Census, unknown repository address, "United States Census, 1910," index and images, FamilySearch (https://familysearch.org/pal:/MM9.1.1/M217-JJC : accessed 8 July 2012), Edward Barfild, St Louis Ward 3, St Louis (Independent City), Missouri., Census lists place of birth Ohio and age 29. 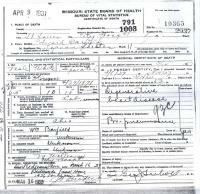 [S508] Edward Barfield, Death Record - BARFIELD, Edward 1937 MO, Edward Barfield's death certificate lists Florance as his wife. [S508] Edward Barfield, Death Record - BARFIELD, Edward 1937 MO, died from degenerative heart disease with contributory causes of Br. pneumonia|was seperated from wife Florence at time of death|occupation Lab. Find A Grave Memorial# 131440153. Mrs. Florence Barfield, 88. of Route 3, Van Buren died at 5:30 a.m., Tuesday, Jan. 25, in the Riverways Manor nursing home. She had been a patient there three months. born March 23, 1883 in Jefferson County, Mrs. Barfield moved to Carter County five years ago from St. Louis. She was a member of the New Harmony General Baptist Church. In 1914 she married Edward Barfield in St. Louis and he died. 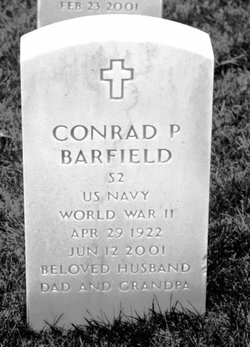 Surviving are sones, Edward and Conrad barfield, both of St. Louis and Jame Barfield of Orlando, Fla; a daughter, Mrs. Anna Christenson of Van Buren; 21 grandchildren and 20 great-grandchildren. Mrs. Barfield's funeral was at 2 p.m. Thursday in the Pewitt-Sloan Funeral Home. The Rev. 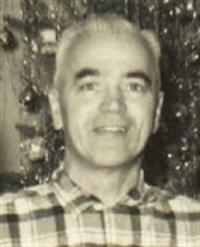 Robert Copeland officiated and burial was in the Van Buren Cemetery. published on 3 February 1972 at The Current Local (newspaper), Van Buren, Carter, Missouri, USA. 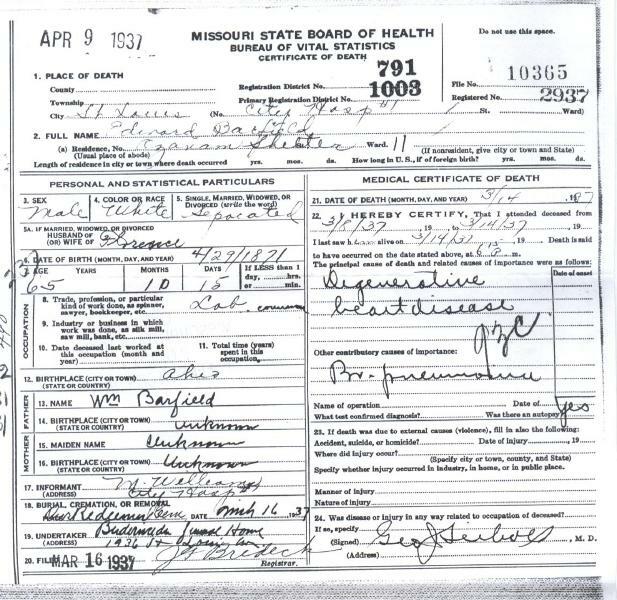 [S571] 15 Apr 1930 Federal Census, unknown repository address, 1930 Federal census lists birthplace as Missouri and age 47 and that fits with YOB of 1883. [S500] 5 January 1920 Federal Census, unknown repository address, 1920 Federal cnesus shows place of birth as Missouri and age 38 which fits with YOB of 1883. Find A Grave Memorial# 32591156. April 4. 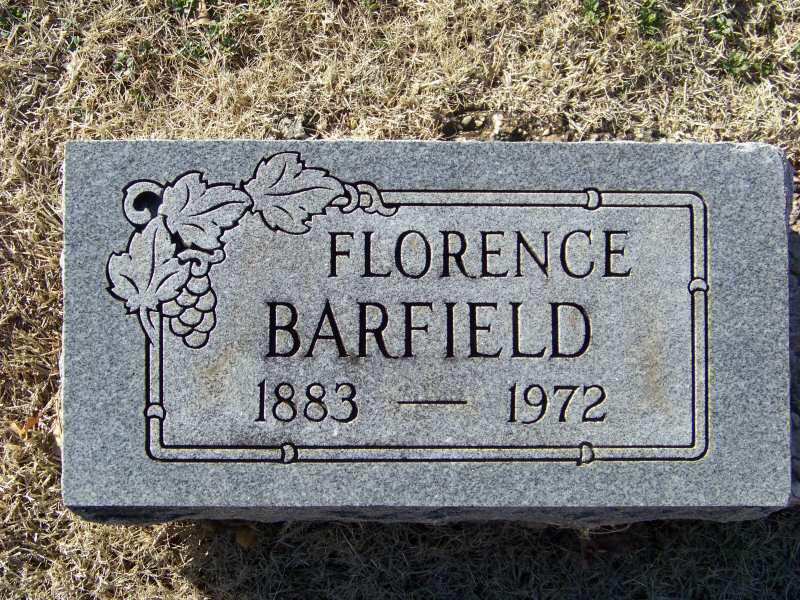 Confirmed Mrs. Florence Barfield - Born March 23, 1883. Verse - Hebrews 13,5., Confirmation Records Lutheran Mission Assoc. He appeared on the census of 5 January 1920 in the household of Edward Barfield and Florence Ware at Saint Louis, Saint Louis, Missouri, USA.4 Edward Thomas Barfield appeared on the census of 15 April 1930 in the household of an unknown person and Florence Ware at Saint Louis, Saint Louis, Missouri, USA.5 Edward Thomas Barfield was confirmed on 9 April 1931.6 He lived with Florence Ware in 1935 at Saint Louis, Saint Louis, Missouri, USA.7 Edward Thomas Barfield appeared on the census of 8 April 1940 in the household of Florence Ware at Saint Louis, Saint Louis, Missouri, USA.8 Edward Thomas Barfield ended military service on 9 February 1946 at Jefferson Barracks, Saint Louis, Saint Louis, Missouri, USA. 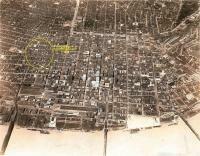 He lived in 1992 at Saint Louis, Saint Louis, Missouri, USA. Obituary of Barfield, age 98 of Bellefontaine Neighbors, passed away on Monday, May 08, 2017 at Crystal Oaks Nursing Home, surrounded by his family. He was born on Apr 25, 1919 in St. Louis, Missouri to Edward Barfield and Florence Barfield. Beloved husband for 75 years of Adelaide Barfield; loving father of Joseph (wife Susan) Barfield, Mary (husband Steve) Dorey, Barbara (husband James) Luhrsen, and Karen (husband Dave) Kostecki; honorary father to Peggy Jagust and Linda Kinder; beloved grandfather of Edward Barfield, Elizabeth Essermann, Russell Dorey, Joe Dorey, Chrissy Endsley, Peter Higgins, and Rob Luhrsen; loving great-grandfather, uncle, close friend and family member to many. Edward and Adelaide loved children, and were wonderful caregivers to many children over the years. Their home was a day care for many, but was often considered just an additional place to visit honorary grandparents. In his spare time Edward enjoyed golfing with his son-in-laws. 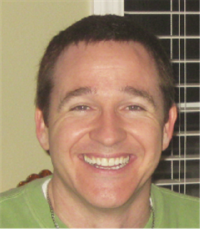 Funeral service for Edward Thomas Barfield will be 10:00a.m. Monday, May 15, 2017 at Kutis South County Chapel. Interment to follow at Jefferson Barracks National Cemetery. 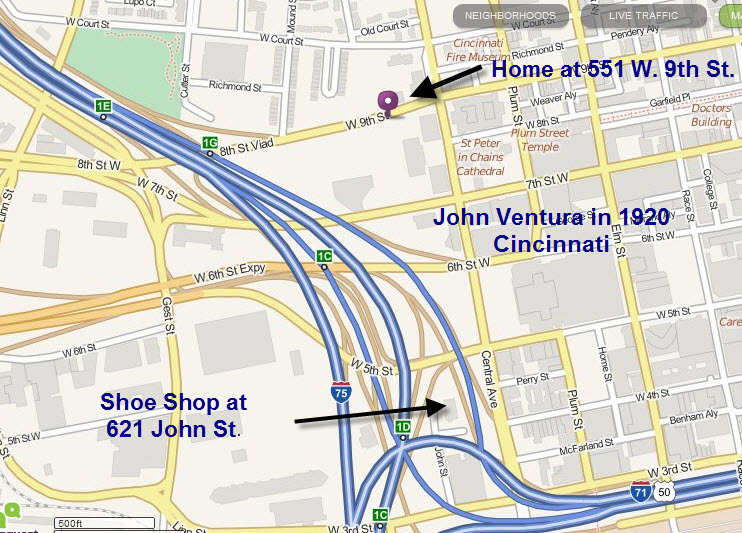 Family will receive friends from 2:00p.m. until 7:00p.m. Sunday, May 14, 2017 at Kutis South County Chapel. In Lieu of flowers memorials may be made to St. Jude Children's Hospital, SSM Health Cardinal Glennon Children's Foundation, or The Pink Sisters. published on 8 May 2017. 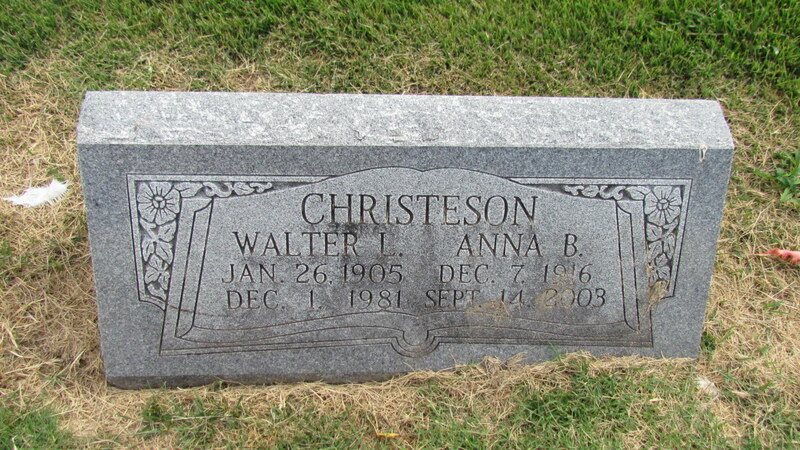 [S754] Find-a-Grave, online http://www.findagrave.com, MEMORIAL ID 179197348. [S573] Unknown subject, 9 April 1931 Confirmation - Edward Tom Barfield, son of Mr Edward and Florence Barfield, nee ' Ware, born April 25, 1919 in St. Louis. Verse: John 3:16., Confirmation & Baptism Records Source Unknown. Gravesite Details WORLD WAR II. 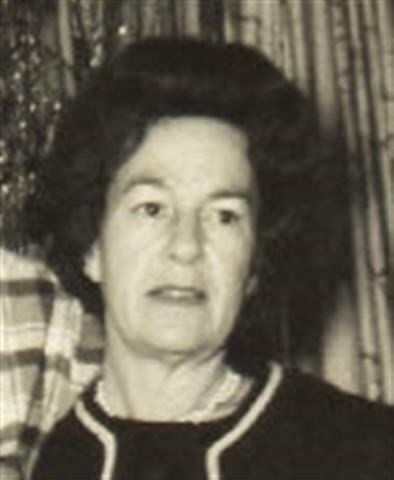 Alice Barfield was born in 1928. Find A Grave Memorial# 132588646. Find A Grave Memorial# 132865609. Doris May Shaw was born on 18 April 1910 at Ottawa, Carleton, Ontario, Canada.3,4 She married Randolf Phillip McLeod, son of Alfred Henry McLeod and Mabel Elizabeth Colpitts, on 7 March 1931 at Luke's Anglican Church, Ottawa, Ontario, Canada.5,6 Doris May Shaw died after 1985 at Ottawa, Ontario, Canada. 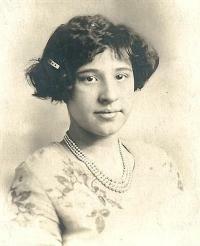 She appeared on the census of 1911 in the household of John Shaw and Elizabeth Botten at 17 Central Ward, Ottawa, Ottawa, Ontario, Canada.7 Doris May Shaw appeared on the census of 1921 in the household of John Shaw and Elizabeth Botten at Capital Ward, Ottawa, Ottawa, Ontario, Canada.8 As of 10 March 1931,her married name was McLeod. Place of Habitation: 129 Waverly. Place Ottawa, Carleton, Ontario, Canada (18 Apr 1910). Where Born 518 Bank St.
[S985] Engagement Anncoucement: SHAW & MCLEOD 1931. [S1103] Ottawa Journal, Ontario, Canada, 11 Mar 1931, 8. Source Information: Ancestry.com. 1911 Census of Canada [database on-line]. Provo, UT, USA: Ancestry.com Operations Inc, 2006. Original data: Library and Archives Canada. Census of Canada, 1911. Ottawa, Ontario, Canada: Library and Archives Canada, 2007. http://www.bac-lac.gc.ca/eng/census/1911/Pages/…. Series RG31-C-1. Statistics Canada Fonds. Microfilm reels T-20326 to T-20460. [S981] 1911 Federal Census, unknown repository address. She b. Prince William Parrish SC. Her married name was Dowling. Her maiden name is shown in husband John Dowlings War of 1812 Pension file. Find A Grave Memorial# 153087105. 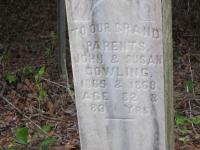 [S754] Find-a-Grave, online http://www.findagrave.com, Find A Grave Memorial# 153087105. 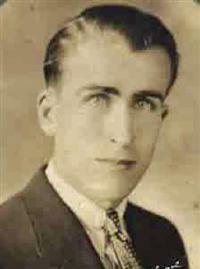 Randolf Phillip McLeod was born on 14 September 1907 at Rusagonis, Sunbury, New Brunswick, Canada.1 He married Doris May Shaw, daughter of John Shaw and Elizabeth Botten, on 7 March 1931 at Luke's Anglican Church, Ottawa, Ontario, Canada.2,3 Randolf Phillip McLeod died on 8 February 2002 at Lachine Hospital, Montreal, Quebec, Canada, at age 94. [S986] Randolph Phillips MCLEOD, Provincial Birth Record for New Brusnwick Number 4137, Code A5/1907, Film F19013 (14 Sep 1907). [S1031] 1911 Canada Census, unknown repository address, Source Citation: Year: 1911; Census Place: , Sunberry and Queens, New. [S1032] 1921 Federal Census Canada, unknown repository address, Reference Number: RG 31; Folder Number: 46; Census Place: Wolfville (Town), Kings, Nova Scotia; Page Number: 12. Her married name was Carol Ann Averette. [S560] Carol Ann Averette, Death Record - AVERETTE, Carol Ann. Jean McLeod died at Ottawa, Ontario, Canada. She was born on 6 July 1933 at Montreal, Quebec, Canada. 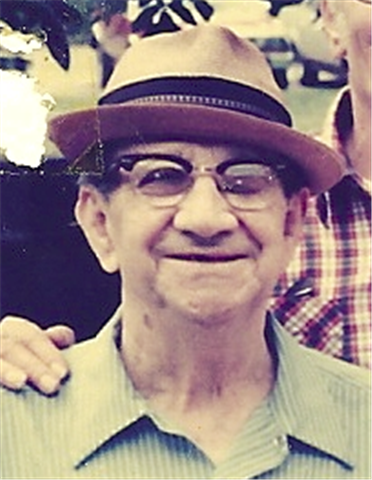 [S481] Unknown volume, Social Security Death Index: lists date of birth as 24 Aug 1915, unknown repository. [S482] Letter, Margo Locke to Walter Wood, 24 Jan 1997, first wife Margo stated Edwin A. Locke III was born in Everett, Mass 24 Aug 1915. 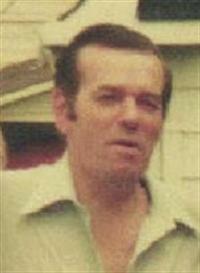 [S2] Personal knowledge of, Walter Dowling Wood, When I met him in 1966 Edwin A. Locke III was going by the nickname Ted. [S481] Unknown volume, Social Security Death Index, unknown repository. Yvonne D Neal was born on 3 March 1918 at Mount Vernon, Westchester, New York, USA. She married Edwin Adelbert Locke III, son of Edwin Adelbert Locke Jr. and Alice Eugenie Hebblethwaite, in 1944 at Quincy, Norfolk, Massachusetts, USA. 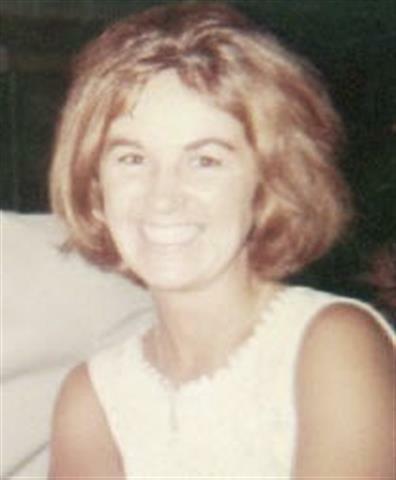 Yvonne D Neal died in 2004 at California, USA. Timothy Leary, who was keenly interested in the spiritual experience provided by LSD, became interested in it's correlates in the Hindu tradition and became a student of Gayatri Devi's. He also introduced some of the ashram inmates, including Gayatri Devi, Bhavani, and Swami Kalikananda (Fred Swain) to it. The guru did not take well to the substance, but Bhavani and others found a fulfilment of their aspirations for samadhi in it. This lead to some of Gayatri Devi's followers to questionong her authority and intentions. Bhavani left the ashram and joined Leary's community in Millbrook. As I mentioned, when I met Bhavani, she was a senior member of the League for Spiritual Discovery, and the keeper of the 'sacrament'. Eventually she gravitated to the Sri Ram Ashram, and when the League was disbanded, she moved with the Ashram to Benson, Arizona, where she remained untill 1969. After that, Bhavani moved to San Francisco (Haight Street) for a couple of years. Then she lived in Palo Alto, Ojai, and finally in MT Shasta, where she passed away in 2004. i believe she was born 3/3/1918. Qui also loved nature. When she lived in California, she would spend her summers in national parks, camping austerely from her car, She loved the wild, untouched by human hand. I still have a tent she gave me when she came to Nepal. She intended to use it hanging out with Yogis and Lamas in the mountains, but a summons from the Welfare Department in California cut short here visit. I want to say one thing to her children. Bhavani only gave them up after her husband remarried and could give them a family life. After they left her, she suffered terrible pangs of separation from them. For many months, in her meditations she felt searing pains in her womb, which she attributed to letitng go of her children. These bouts of suffering left her drained and exhausted, and she had to go and meditate in a field or grove so as not to draw attention to herself and disturb the ashramites with her cries and whimpering. She always kept a photo of her son, Wynn, near her. Love & pranams, William Forbes on 2 July 2011. The first use on the given name Yvonne is in the 1930 US Census. In 1920 her name ws shown as Dorothy F Neal. [S926] 7 Jan 1920 Federal Census, unknown repository address.